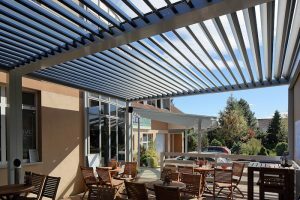 The Pergola Agava is a brand new innovative bioclimatic louvred roof system from Milwood. Consisting of motorised aluminium blades that lock to form a watertight seal, these systems can provide shelter even in the wettest weather conditions. With 120° of movement, the blades can open up to encourage not just sunlight, but also a natural feeling airflow from above. This system is the perfect mix of sun and shade, and has a minimalist and timeless design that hides it’s impressive technicality. 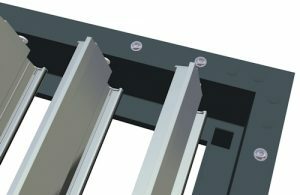 Able to be mounted to a wall, the fittings that aid with this are completely invisible, whilst the motor to control the blades is incorporated within the frame. Made from strong and aesthetically pleasing aluminium, these systems are strong, durable and highly weather resistant, able to withstand and protect against sun, wind, rain, and even snow. Rainwater is channeled away through the insides of the supporting columns, and the system is made in accordance to UK Wind and Snow Loadings. These systems are also highly flexible, with a range of three designs, the largest of which is able to cover up to five metres by seven metres. Of course, multiple systems can be joined to cover larger areas. 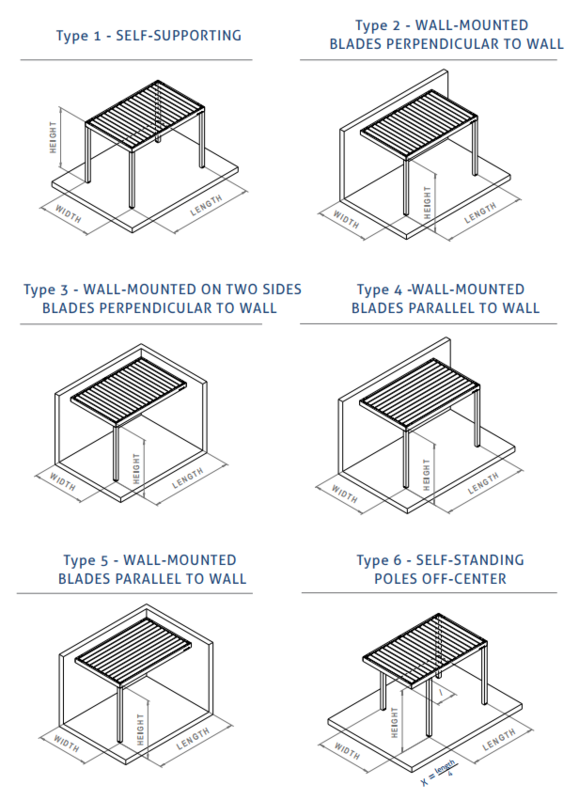 It is also able to either stand alone as a self supporting system, or as previously mentioned it can be turned into a lean to system, where it is fitted to an existing wall or structure. The sides of the system can be filled in, with glass doors, wood panels or aluminium panels, all of which slide for full flexibility. Alternatively, vertical motorised blinds are available. Additionally, they come with a variety of optional extras, such as LED lights incorporated into the blades, heaters, and even sensors that detect wind, rain, snow, and the temperature. There’s also an option for incorporated sound systems that can turn the area into either the soul of the party, or an island of tranquility where you can relax, sheltered from the effects of the weather. The frame and roof blades can be finished in a choice of three colours as standard, however for a small additional cost they can be finished in any RAL colour, to help with commercial branding or simply create an impact. The Pergola Agava comes with a five year guarantee for the aluminium frame, and a 2 year guarantee for the electrical components. Find the PDF’s for all three models here.